It's amazing what your liver can handle. Whether you're living on campus or in a sharehouse, cleaning isn't necessarily a ~regular~ thing. 2. ...But the most surprising thing is how much it won't affect you. 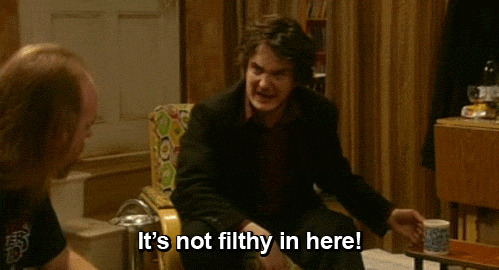 Uni students - at some stage - will be gross and live in filth. 3. It's ridiculous annoying packing all your stuff up - but get used to it. Chances are you'll be doing it again soon. Moving away for college is one thing, but it starts the pattern of moving houses frequently for most of your young adult life. 4. You'll be amazed how many nights in a row you can drink. O-week isn't exactly a sober week. 5. And you will make a lot of ~bad~ decisions. It's all a part of becoming an adult. 6. You will click with some people incredibly well. Uni is definitely a time to find your people. 7. And the terms "cool" or "popular" are so not a thing anymore. The great thing about uni is social status is generally not a thing anymore and it's AMAZING. 8. Your diet definitely won't be great. Mi goreng and hungover McDonald's will probably dictate your first year of uni life. 9. So you'll probably gain a little bit of weight in your first year. 10. And you'll nap more than any other time in your life. And that includes the time you were three. 11. You should really, TOTALLY take advantage of the summer break. You'll probably never get that much free time again. 12. Your classes won't always be interesting. If you think some high school classes are boring now, just wait for some of your theoretical lectures. 13. And you'll do a lot less readings than what you think. Struggle through page one, eyes drooping at page two, nap time by page three. 14. There will be days when you feel like you're totally losing your mind. Most of those times will occur on the day you have an assignment due - that you haven't started yet. 15. And there will also be times you question whether you're in the right degree. 16. You'll miss your parents a lot more than you think. 17. And going home where you can raid the pantry and sleep in your own bed again will make you incredibly happy. 18. Time will inevitably go incredibly fast. Before you know it, the four or so years of your degree will be over. 19. And you will look back on uni as some of the best days of your life.